Here at Canteen Smithy Engineering. Our toolmakers have a wealth of experience, some in excess of 35 years at the factory, but still passing on vital knowledge to new apprentices to ensure a future of precision engineering with both manual and computer skills to envy. Because of this we are able to offer our customers not only competitive prices on new tooling projects, but also the chance to keep old tooling producing reasonable quality components by refurbishing at a fraction of the cost. With or without drawings we have proved time and time again that this can be an alternative solution, or assist in keeping production going whilst designing and manufacturing a new mould. With over 35 years experience in Precision Mould Manufacture of both pre-toughened and fully hardened tools, New technology plays a major part at our factory and investment in the future starts here. The implementation of our own in-house design studio and the use of SolidWorks and its fully parametric abilities have become an important part in this technology. 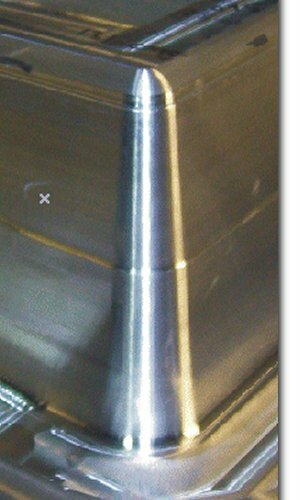 Coupled with Powermill and Powershape our CNC millers are able to handle the most complex challenges. The fitting shop is equipped with Bridgeport Turret Mills, Jacobsen surface grinder, lathes, cylindrical grinder amongst other equipment. Continued investment in people and technology will be the key to future success at Canteen Smithy Engineering, along with commitment to quality & customer satisfaction.